Repurposing a German psoriasis treatment for the second time? First for Multiple Sclerosis and second for some Autism? Today�s post is about one anti-inflammatory aspect of ketones; part 4 in this series will look at Ketones and their effect on the NLRP3 inflammasome, which also relates to inflammation; but it would be too much for one post. If you have elevated levels of the inflammatory cytokine IL-1�, common in much autism and Alzheimer�s, part 4 of this series will be very relevant. Today we just look at HCA2, which should be interesting for people with Multiple Sclerosis (MS), psoriasis and anyone with autism who responds to HCA2 activation. In Germany a tailor-made solution already exists for a potential clinical trial to evaluate the effect of HCA2 activation; and even with low dose tablets. Activating HCA2 inside the gut can be used to reduce colonic inflammation; for this you would need your HCA2 activator to be in your colon, so the ketogenic diet would not help whereas fiber and the right probiotic bacteria would help. For some autism and multiple sclerosis, you would think we just want to activate HCA2 receptors in the brain, but it may not be so simple. There is no perfect solution to activate HCA2, mainly because it can cause flushing. The flushing effect is due to HCA2 activation of ERK 1/2 MAP kinase. Activation of MAP kinase in turn causes release of prostaglandin D2 (PGD2) from Langerhans cells in the skin and this causes flushing. The same PGD2 released in the brain is metabolized to another substance, 15-d-PGJ(2), which is a PPAR? agonist. PPAR gamma has been covered elsewhere in this blog, because agonists should be beneficial in some autism, however using a tangeretin/nobiletin supplement, that is a mild PPAR? agonist, the positive effect lasts just a few days. There are potent new drugs in development that may avoid flushing. Discovery and characterization of GSK256073, a non-flushing hydroxy-carboxylic acid receptor2 (HCA2) agonist. All the above options have other effects. BHB from BHB supplements inevitably contain large amounts of Ca, K, Na or Mg, which will have their own effects. Niacin causes flushing at higher doses. Butyric acid has many potential beneficial effects, but too much may have some negative effects, at least in some people. It is an HDAC inhibitor, giving potential epigenetic effects. Dimethyl fumarate (DMF) is likely the most potent current HCA2 agonist and can work wonders for severe psoriasis, some arthritis and some multiple sclerosis, but at these high doses does have some side effects. Dimethyl fumarate (DMF) for psoriasis is not a cream, rather a coated tablet, the kind you are not supposed to cut in half. The adult dose can be 240mg three times a day, but as you can see in the photo at the start of this blog a 30mg tablet exists. So, a practical low dose Dimethyl fumarate exists as a mild HCA2 agonist, but quite possibly it is more potent than niacin. DMF as a drug is a bit pricey in Germany and exorbitantly expensive in the US. DMF as a chemical is very cheap. Much is already known about how activating HCA2 can reduce neuroinflammation. 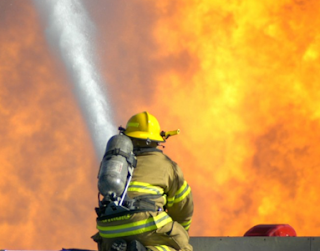 Putting out the fire, so to speak, is doubly important in much autism because inflammation makes chloride levels rise inside neurons (via increasing NKCC1 and reducing KCC2 expression). Elevated chloride levels make the neurotransmitter GABA work �in reverse� as excitatory; our current drug, bumetanide, to lower chloride levels lacks potency. If inflammation increases there comes a point when bumetanide no longer is able to maintain chloride at a low enough level; it then appears as �bumetanide has stopped working�. Nutritional or pharmacological activation of HCA (2) ameliorates neuroinflammation. Neuroinflammation is a pathology common to many neurological diseases, including multiple sclerosis (MS) and stroke. However, therapeutic attempts to modulate neuroinflammation have proved difficult. Neuroinflammatory cells express HCA2, a receptor for the endogenous neuroprotective ketone body �-hydroxybutyrate (BHB) as well as for the drugs dimethyl fumarate (DMF) and nicotinic acid, which have established efficacy in the treatment of MS and experimental stroke, respectively. 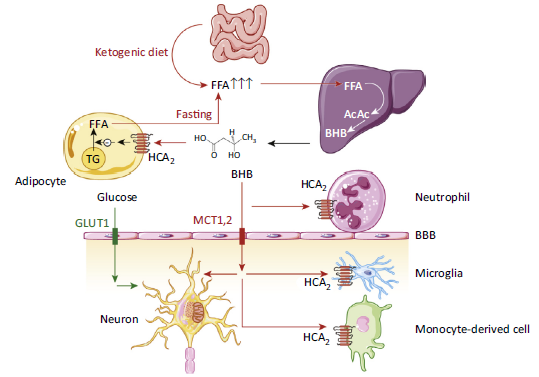 This review summarizes the evidence that HCA2 is involved in the therapeutic effects of DMF, nicotinic acid, and ketone bodies in reducing neuroinflammation. Furthermore, we discuss the mechanisms underlying the beneficial effects of HCA2 activation in neuroinflammatory diseases and the therapeutic potential of recently developed synthetic ligands of HCA2. Figure 1. Potential anti-neuroinflammatory role of HCA2 as a target of monomethyl fumarate (MMF) and nicotinic acid (NA). 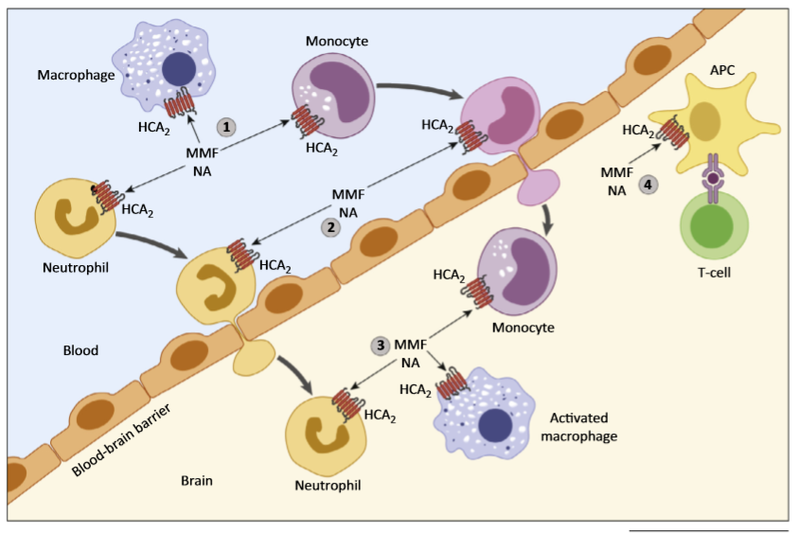 Based on the expression of HCA2 in neutrophils, monocytes, macrophages, and dendritic cells, several mechanisms underlying the immunomodulatory and anti-inflammatory effects of MMF and NA can be envisioned. Both drugs may have systemic effects on monocytes, macrophages, or neutrophils outside the central nervous system (CNS) (1) that indirectly affect neuroinflammatory processes by altering the capacity of immune cells to enter the CNS or to promote neuroinflammation. There is also evidence that MMF and NA are able to directly inhibit neutrophil and possibly also monocyte infiltration through the blood�brain barrier (2) and they may also affect their inflammatory function within the CNS (3). Finally, as antigen-presenting cells (APCs) that reactivate T cells in the perivascular space may also express HCA2, inhibition of APC function through HCA2 may contribute to the anti-neuroinflammatory effects of HCA2 agonists (4). Figure 3. HCA2 mediates the neuroprotective effect of b-hydroxybutyrate (BHB). On a normal diet, glucose (from the blood) serves as the main energy substrate of the brain (green arrows). It is transported by GLUT1 over the blood�brain barrier (BBB) and metabolized. During fasting, adipocytes release large quantities of free fatty acids (FFAs) from stored triglycerides (TGs) (red arrows). Alternatively, a high-fat, low-carbohydrate ketogenic diet leads to elevated FFA supply. In the liver FFAs are metabolized to the ketone bodies acetoacetate (AcAc) and BHB. In a negative feedback circuit, BHB binds to its receptor HCA2 on adipocytes and inhibits the release of TG. In the periphery, or after being transported into the central nervous system (CNS) by monocarboxylate transporter (MCT) 1 or 2, BHB also binds to HCA2 on neutrophils, microglia, and monocyte-derived cells and dampens neuroinflammation. In addition, BHB is a substrate for mitochondrial energy production in neurons. BHB is not only a metabolic intermediate but also a signaling molecule that activates HCA2 and inhibits the G protein-coupled receptor GPR41 and histone deacetylase (HDAC) 1, 3, and 4 [94,95]. This led to the hypothesis that BHB induces neuroprotective effects through specific actions on receptors or enzymes. The IC50 values for inhibition of HDAC and GPR41 by BHB are higher than the EC50 for activation of HCA2 [94,95], suggesting HCA2 as the preferred target when BHB levels rise. The ketone body �-hydroxybutyrate (BHB) is an endogenous factor protecting against stroke and neurodegenerative diseases, but its mode of action is unclear. Here we show in a stroke model that the hydroxy-carboxylic acid receptor 2 (HCA2, GPR109A) is required for the neuroprotective effect of BHB and a ketogenic diet, as this effect is lost in Hca2(-/-) mice. We further demonstrate that nicotinic acid, a clinically used HCA2 agonist, reduces infarct size via a HCA2-mediated mechanism, and that noninflammatory Ly-6C(Lo) monocytes and/or macrophages infiltrating the ischemic brain also express HCA2. Using cell ablation and chimeric mice, we demonstrate that HCA2 on monocytes and/or macrophages is required for the protective effect of nicotinic acid. The activation of HCA2 induces a neuroprotective phenotype of monocytes and/or macrophages that depends on PGD2 production by COX1 and the haematopoietic PGD2 synthase. Our data suggest that HCA2 activation by dietary or pharmacological means instructs Ly-6C(Lo) monocytes and/or macrophages to deliver a neuroprotective signal to the brain. DMF (Dimethyl fumarate) is in effect a prodrug, it is converted in the body by our friendly antioxidant glutathione (GSH) into MMF (monomethyl fumarate). It is MMF that is the active substance. DMF has long been used as a drug to treat severe psoriasis, an inflammatory condition of the skin. It was later found that in people psoriasis and MS, that when they took DMF for their skin problem their multiple sclerosis symptoms reduced. Since we assume that DMF improves MS by activating HCA2, it would be logical to look at the effect of other activators of this niacin channel in MS.
We now have a hugely expensive FDA approved therapy for MS, based on the DMF used in Germany to treat psoriasis. What about other HCA2 activators? Perhaps some in your kitchen? One that caught my eye was Cinnamic Acid. Sure, it has less affinity for the receptor than some of the other substances, but it is an HCA2 activator. When you eat cinnamon, the cinnamaldehyde present is converted into cinnamic acid by oxidation. In the liver, this cinnamic acid is �-oxidized to benzoate that exists as sodium benzoate. Phenolic acids are found in abundance throughout the plant kingdom. Consumption of wine or other rich sources of phenolic acids, such as the �Mediterranean diet,� has been associated with a lower risk of cardiovascular disease. The underlying mechanism(s), however, has remained unclear. Here, we show that many phenolic acids, including those from the hydroxybenzoic and hydroxycinnamic acid classes, can bind and activate GPR109A (HM74a/PUMA-G), the receptor for the antidyslipidemic agent nicotinic acid. In keeping with this activity, treatment with a number of phenolic acids, including cinnamic acid, reduces lipolysis in cultured human adipocytes and in fat pats isolated from wild-type mice but not from mice deficient of GPR109A. Oral administration of cinnamic acid significantly reduces plasma levels of FFA in the wild type but not in mice deficient of GPR109A. Activation of GPR109A by phenolic acids may thus contribute to a cardiovascular benefit of these plant-derived products. Phenolic acids are highly present in the Mediteranean Diet and so you might wonder if this diet is protective. Apparently it is. Mediterranean diet (MD) adherence and risk of multiple sclerosis: a case-control study. Our study suggests that a high quality diet assessed by MD may decrease the risk of MS. So how about cinnamon as a home remedy for MS? Well is seems to help mice with MS. Although the central nervous system (CNS) is separated from the immune system by blood-brain barrier and traditionally considered �immune privileged�, our immune cells are capable of targeting the brain, leading to the development of CNS autoimmune disorders. Multiple sclerosis (MS) is one such autoimmune disorder of the CNS in which myelin components are particularly targeted by the immune system resulting in demyelination of axons and associated debilitating symptoms [1�3]. In spite of intense investigations, no effective therapy is available for this disease. Therefore, a safe and effective therapeutic option is necessary for MS.
Fortunately, we have been endowed with enormous natural remedies to take care our health issues. For example, cinnamon, the brown bark of cinnamon tree, that has already been being used for centuries throughout the world as spice or flavouring agent. Furthermore, medieval physicians used cinnamon for medical purposes to treat a variety of disorders including arthritis, coughing, hoarseness, sore throats, etc. Recent studies are indicating that this natural product may be helpful for MS [4�6]. Although the etiology of MS is poorly understood, it is becoming clear that widespread inflammation, loss of regulatory T cells (Tregs), hyperactivity of autoimmune Th1 and Th17 cells, breakdown of blood-brain barrier (BBB) and blood-spinal cord barrier (BSB), and loss of neuroprotective molecules in the CNS are critical for the manifestation of demyelinating pathology in MS [1�3]. Interestingly, cinnamon treatment is capable of modifying these pathological features in mice with experimental allergic encephalomyelitis (EAE), an animal model of MS [4,6]. � DMF may act in neurodegeneration and inflammation by activating the Nrf2 pathway. � DMF and MMF downregulates the immune response through HCA2/GPR109A pathway. � Nrf2 and HCA2/GPR109A pathways activation may explain DMF�s efficacy and safety profile. Conclusion: Although the DMF/MMF mechanism of action remains unclear, evidence suggests that the activation of HCA2/GPR109A pathway downregulates the immune response and may activate anti-inflammatory response in the intestinal mucosa, possibly leading to reduction in CNS tissue damage in MS patients. The mechanisms of action of MMF and DMF are not well understood, but a growing body of evidence has demonstrated that DMF may act on both the neurodegenerative and inflammatory response of MS patients. The majority of the data related to the mechanism of action of DMF/MMF demonstrates the association of the compounds with the activation of the nuclear factor-(erythroid-derived 2) related factor 2 (Nrf2) pathway. Nrf2 activation leads to a type II antioxidant response, reducing both inflammatory responses and oxidative stress 11, which play a major role in demyelination and neurodegeneration in MS. In addition to the Nrf-2 signaling pathway, recent observations demonstrated that MMF/DMF could also downregulate the immune response through a on-Nrf2 related pathway. MMF has been shown to be an agonist of the hydroxycarboxylic acid receptor 2 (HCA2) signaling pathway, also known as niacin receptor 1 or nicotinic acid receptor GPR109A.12-14 Thus, it appears that DMF could also activate HCA2/GPR109A in addition to its effects on the Nrf2 pathway (unpublished data, Biogen). In this communication, we discuss DMF/MMF-induced HCA2/GPR109A pathway activation and its implications in the immune response and treatment of MS. Moreover, Parodi and colleagues described a novel HCA2/GPR109A signaling pathway modulating microglial activation in an in vitro study .13 MMF binding to HCA2/GPR109A led to subsequent activation of the G1-type G protein signaling cascade by a possible release of the ?? subunit of G-protein. The increase of Ca2+ induced the activation of AMP-activated protein kinase (AMPK) by calcium/modulin�dependent protein kinase 2 (CaMKK2). In addition, the authors provided evidence that AMPK activation led to an increase in NAD+ generation through phospho-AMPK (pAMPK) and finally activation of SIRT1 (sirtuin 1), which resulted in further inhibition of NF-kB signaling. NF-kB inhibition suppresses pro-inflammatory cytokines and reduces the migration of immune cells into the CNS in the EAE model. In addition, cultured microglial cells also showed reduced pro-inflammatory responses contributing to regulation of synaptic activity.13 All these previous data confirm that both DMF and/or MMF are effective in reducing the severity of EAE. A growing body of evidence suggests that nutrition and bacterial metabolites might impact the systemic immune response in autoimmune diseases, such as MS and its experimental models.33 Mucosal tolerance studies have shown that activation of tolerogenic intestinal immune cells can reduce the inflammatory response of autoimmune disease in the CNS.34 The oral administration of myelin basic protein (MBP) significantly reduced the severity of EAE34, at the same time activating and increasing the frequency of TGF�-producing regulatory T-cells in the gut.35 HCA2/GPR109A is a receptor for butyrate and mediates some of beneficial effects of short-chain fatty acids produced by the gut microbiota.36 Ongoing microbiome studies have highlighted the importance of commensal bacteria both in induction and suppression of autoimmune diseases and this is being actively studied as a potential target for the treatment of immune-mediated maladies.37 A previous study demonstrated that administration of short-chain fatty acids to mice with EAE ameliorated symptomatic disease and reduced axonal damage through activation of regulatory T cells (T-reg) in intestinal mucosa.33 Other studies demonstrated that G protein-coupled receptors such as HCA2/GPR109A are potentially involved in increased extrathymic differentiation of T-reg cells. 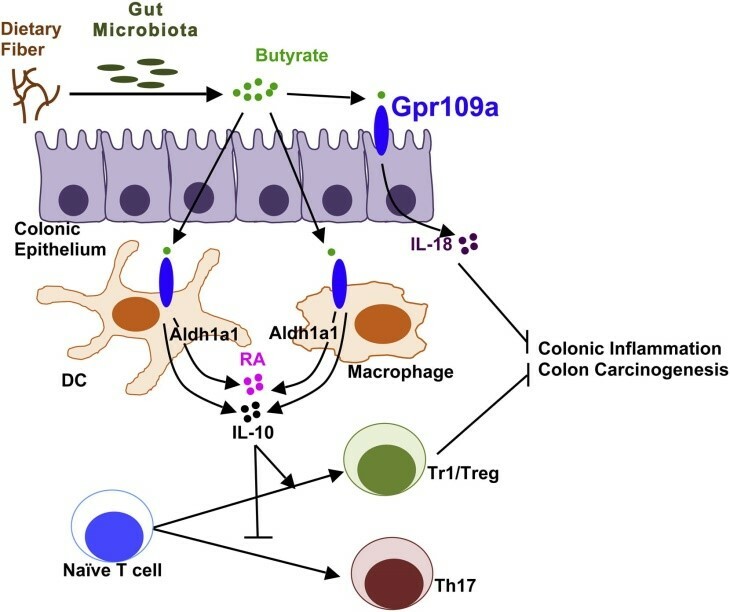 The activation of HCA2/GPR109A by butyrate metabolites from commensal microbiota increased the generation of colonic Tregs.38 Also, HCA2/GPR109A signaling promoted anti-inflammatory properties in colonic macrophages and dendritic cells and enabled them to induce differentiation of T-reg cells, which suppress colonic inflammation and carcinogenesis.39 The same study demonstrated that the activation of HCAR2 receptors is crucial to generate T-regs since colonic DCs and macrophages from Niacr1-/- mice are defective in inducing differentiation of these cell population.39 In addition to the generation of T-reg cells, the activation of HCA2/GPR109A in epithelial cells in the small intestine may induce the production of PGE2,15 which contributes to the anti-inflammatory response. PGE2 suppresses the production of proinflammatory cytokines and enhances the synthesis of anti-inflammatory cytokines.40 Therefore, PGE2 is not only a proinflammatory molecule but also a modulator of immune responses40. We hypothesize that DMF/MMF may amplify the anti-inflammatory response by binding to HCA2/GPR109A in gut cells (dendritic and epithelial), inducing the production of PGE2. Since DMF is metabolized in the gut, further studies are necessary to demonstrate whether the DMF/MMF stimulation of anti-inflammatory response in the gut may also contribute to the reduction of the tissue damage in the CNS of MS patients. Most MS is the relapsing remitting kind. Acute episodes are generally treated with steroids, which are inexpensive. Some people�s autism is episodic; there is a base level and then there are periods when it becomes much more severe. While there are no cures for MS there are disease modifying treatments that aim to reduces the frequency of the acute periods and reduce the damage that they cause. Since MS is essentially an auto-immune conditions, these treatments are all based on modifiying the immune system. They can have the side effect of overly reducing the immune response and then not fighting off a dangerous virus. � Interferons are used particularly to reduce the level of the proinflammatory cytokine IL-1beta. � Monoclonal antibodies are used to strengthen the blood brain barrier (and leaky gut barrier in Crohn�s) and so reduce the ability of inflammatory cytokines to enter the brain. In terms of potency and value, the UK�s review body was pretty upbeat about Dimethyl Fumarate. All the disease modifying treatments for MS are hugely expensive, which must limit their use. Interestingly, estrogen receptor beta (ER�) is very relevant to MS, as we have seen it is to autism and also SATB2. The most potent accessible agonist of ER� is estrogen/estradiol, but unfortunately it also affects ERa. The ideal solution would be a brain specific selective agonist of ER�. This does actually exist; it is called DHED, but it has not been commercialized. I think DHED would be helpful in MS, SATB2 and much idiopathic autism. It is not surprising that MS mainly affects females and not surprisingly it gets worse post menopause. You would think someone would make the connection and treat this (with an ER� agonist). Another very logical therapy for MS is to use a PDE4 inhibitor to improve remyelination, this happens via activating PKA. PDE4 inhibition will also be broadly anti-inflammatory and this is why it is effective in asthma and COPD. The good news is that the Japanese have been using a PDE4 inhibitor (Ibudilast) for decades to treat asthma. So its safety profile is well known. Not surprisingly under the new name MN-166, Ibudilast is showing promise. In Western world Roflumilast (Daxas) is the widely used PDE4 inhibitor. It looks to me that the Japanese created a better drug - more selective and fewer side effects. In the long term MS trial of Ibudilast it was found that while GI side effects did occur at higher doses, they settled in 2-4 days; so no bid deal. Daxas does cause nausea, Ibudilast seems not to. PDE4 inhibition is a very logical therapy choice for some autism and SATB2. There are features of MS that are relevant to some autism, just like some MS features relate to Crohn�s. So, there is merit in understanding the current knowledge of MS treatment. In terms of personalized medicine, we can see this broadens the potential toolkit to treat aberrant immune responses. You can also see how someone with MS might benefit from reading autism science. They really should be making sure they produce enough butyric acid to maintain tight epithelial barriers. Butyrate not only causes a tightening of the intestinal epithelial barrier, but also the blood brain barrier. So if a leaky BBB is a feature of MS, then you want either to ferment butyric acid in your colon or a take sodium butyrate orally. In Chinese medicine there are treatments for postmenopausal osteoporosis, not surprisingly they are herbal ER� agonists. The one recommended in a recent paper based on potency and safety was something called EXD (Er-Xian Decoction), more potent than Icariin as favoured by our reader Aspie1983. Among the EXD, EBH, and ICA, EXD was found to have superior efficacy and safety profile. Consuming soy will also activate ER�, but you would need to eat it like a Japanese (lots of it). 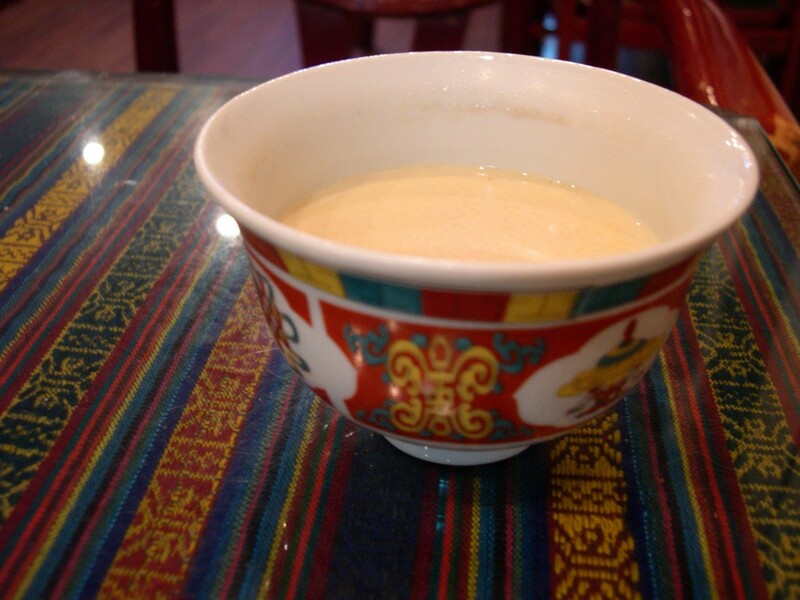 Butter tea, as found in Tibet and nearby, would be rich in butyric acid and so should improve a leaky blood brain barrier. I drank this very tea, made with Yak butter, decades ago and still recall the taste/smell. I did stumble across one Australian psoriasis sufferer, who was self-treating with cheap non-medical DMF bought overseas. He seemed very happy with the result. If he develops MS he might just need to increase the dose. Which HCA2 activator for some autism? � Acipimox, a niacin derivative drug to lower cholesterol. I have written about cinnamon before on this blog and I like the things it does, but if I was making a clinical trial I would go straight for the one that really should work, which is DMF. At high doses many people get side effects from DMF, but they usually fade over time. Since BHB is not such a potent HCA2 activator, I doubt a large dose of DMF would be needed. Most readers of this blog are in North American, home of expensive drugs. Today you may be shocked at just how much is charged for DMF in the US. In the form of Fumaderm, it available for free in some European countries. Fumaderm� in daily practice for psoriasis: dosing, efficacy and quality of life. Why is Biogen being allowed to charge$55,000.00 per year for dimethyl fumarate (Tecfidera�)? Very recently a Spanish company has started to market DMF as a drug called Skilarence, so hopefully the price will eventually fall. Dimethyl fumarate (DMF) is actually an inexpensive bulk chemical that is widely available. Originally it was used in Germany to treat psoriasis. Assuming a defect in the citrate cycle as the cause of his own psoriasis, Walter Schweckendiek, a German chemist, treated himself with large doses of succinic acid. When this first attempt was ineffective, he turned to the next metabolite in the cycle, fumaric acid, and experienced a �cure� from his disease, as he reported in 1959. To improve the gastrointestinal tolerance of fumaric acid he later used esters of fumaric acid. Although Schweckendiek published his own case report in a well-known German medical journal, his discovery first remained largely unrecognized by the academic medical community and spread mainly among alternative practitioners. This is how Hans-Peter Strobel, a Swiss village pharmacist, learned about the alleged efficacy of fumaric acid esters in 1982. One year later he founded the company Fumapharm AG, which further investigated fumaric acid esters leading to a Phase III study against psoriasis headed by Peter Altmeyer in 1994. 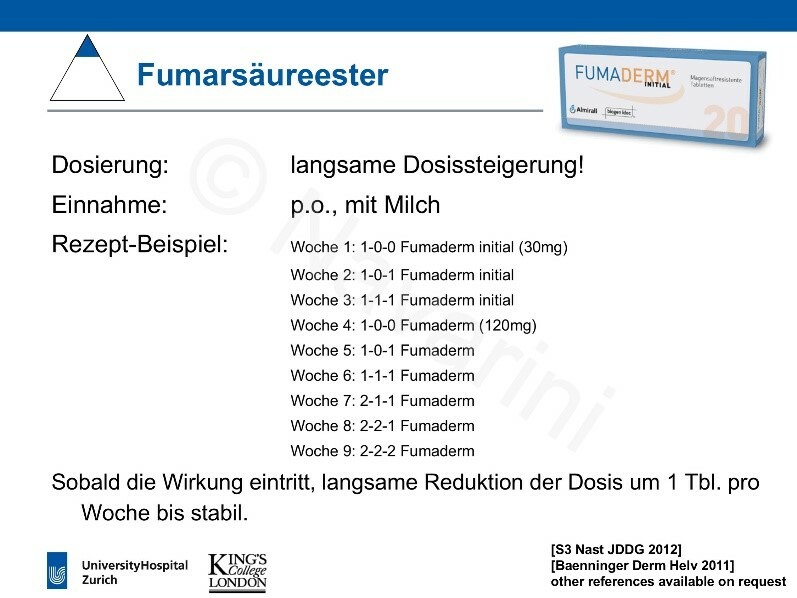 This study earned fumaric acid esters the approval for treatment of psoriasis in Germany. Fumaderm, a preparation comprising mainly DMF, was on the German market for several years when neurologists in Germany recognized its efficacy against MS. In 2006 Biogen Idec bought Fumapharm and further developed DMF for the treatment of MS. In the US Biogen sell Dimethyl Fumarate as Tecfidera, a single 240 mg tablet costs $120. In Germany, the local company, also owned by Biogen of the US, still sells it as a treatment for psoriasis; a single tablet of Fumaderm 120mg for $4. In China you can buy 100g for $6. It looks like China is the place to be if you have MS. The Chinese just buys a bag of empty enteric capsules, measures out his DMF with his $10 micro scales. Enteric capsules dissolve in the lower intestine where it is alkaline. Some drugs cannot survive in acidity earlier on in the digestive process. His US counterpart (or his insurer) would pay $87,600 at the full price. A German pharmacy would charge $5,840. The UK NHS will for sure have a discount on the German price and now they have switched to the Spanish version, Skilarence. I think Walter Schweckendiek, the pioneering German chemist, who did all the original self-experimentation, would go for the �Chinese option� and treat himself for the annual cost of 3 Wiener Schnitzels. We know that some people with autism have terrible GI inflammation; by activation HCA2 (also called Gpr109a) some people with colon inflammation may get some relief. In the study below, they refer to the HCA2 activator butyric acid, but any HCA2 activator that end up in the colon should have the same effect. To produce butyric acid, eat fiber and a butyric acid producing bacteria, as covered in earlier post. It also is proposed that activating HCA2 in the gut has a positive effect in the brain for people with MS.
HCA2 activation looks very interesting and I would love to know if this is a mechanism by which BHB/C8 supplements are improving autism for some readers of this blog. It looks highly plausible. In one of the papers it was suggested that this is more likely than HDAC inhibition, because the effect of the ketone BHB on HCA2 is much larger than on HDAC 1, 3 or 4. I am also interested that PPAR gamma is also activated via HCA2-PGD2 and then its metabolite 15d-PGJ, because the PPAR? agonists tangeretin/nobiletin in the supplement Sytrinol gives an improvement in autism for some people but for most, like my son, it only last 3 or 4 days. The more potent PPAR? agonists used to treat Type 2 diabetes are reported in studies to improve some autism. Cinnamon also seemed to have an effect in my trial, but there are several different substances in cinnamon that might be helping. I had not considered Cinnamic acid until this post. People do use niacin for autism but based on the same level of science that made some people think that Multiple Sclerosis was caused by vitamin B3 deficiency (it is not). The MS research raises the possibility that inflammation in the intestinal mucosa may be driving inflammation in the brain and that the effectiveness of HCA2 activation is in part driven by what is happening to the HCA2 receptors in your intestines rather than those in your brain. I really do think some researcher should trial those little 30mg Fumaderm starter pills on people with autism. They use these lower dose pills before building up to the full psoriasis dose. The MS dose in the US is very much higher, 240mg twice a day.